It was very disappointing to wait over an hour to see doctor Kim. I understand there are times when doctors getbacked up, but I received an (I'm sure automated) message asking me to arrive 15 minutes early, which I did. Why not give patients a call or text when you know you are that far behind? Otherwise, my time with the doctor was great. He wasn't rushed and was very pleasant to work with and did apologize twice for my wait. It was very disappointing to wait over an hour to see doctor Kim. I understand there are times when doctors get backed up, but I received an (I'm sure automated) messageasking me to arrive 15 minutes early, which I did. Why not give patients a call or text when you know you are that far behind? Otherwise, my time with the doctor was great. He wasn't rushed and was very pleasant to work with and did apologize twice for my wait. I came to Dr. Kim with a balance disorder no other doctor I saw (and I saw many) knew anything aboutand am now cured. I would return to Dr. Kim in a heartbeat if the condition ever returned. He was truly a miracle doctor for me. I came to Dr. Kim with a balance disorder no other doctor I saw (and I saw many) knew anything about and am now cured. I would return to Dr. Kimin a heartbeat if the condition ever returned. He was truly a miracle doctor for me. **Before coming in for your first appointment, please make sure to print and complete the forms under your "upcoming appointments" tab on Zocdoc. Thank you! ** **Please Note: Dr. Kim specializes in the treatment of ears – when booking for an ENT Consultation, we will not see patients for nose and throat appointments, only ears** "If you have an emergency, please contact the office directly so we can help you* Dr. Kim has been active in research in Meniere’s disease, cochlear implantation, and the effects of surgery for acoustic neuroma, presenting at numerous national meetings and publishing numerous articles in peer reviewed journals for otolaryngology and otology/neurotology. He has also contributed to numerous textbooks on surgery of the ear and management of balance disorders. He is certified by the American Board of Otolaryngology in both Otolaryngology and Neurotology. He is also certified in Gamma Knife Radiosurgery in the Management of Acoustic Neuromas. 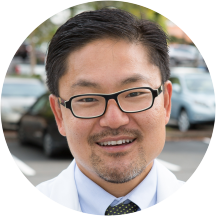 Dr. Kim is a fellow of the Triological Society and the American Academy of Otolaryngology/Head and Neck Surgery. He is a member of the American Medical Association, the Oregon Academy of Otolaryngology/Head and Neck Surgery, and the Otosclerosis Study Group. He was real good in explaining that most people in their 70's will experience Tenninitis. That I told him that I will see how it goes to the end of the year and also I told him how often and whenit gets real loud. I understood that I have to live with it and I'm ok with that. He didn't seem very interested in trying to understand my ear issues. Said nothing was wrong.